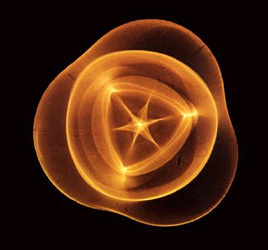 Cymatics is derived from the pioneering work of Swiss scientist, D. Hans Jenny, who in the 1960s coined the term Cymatics from the Greek word for ‘wave’. 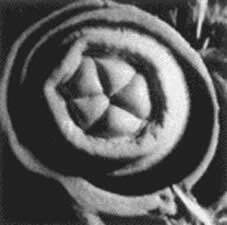 Dr Jenny spent over 14 years documenting his experiments in great detail, publishing books and films showing many intricate and elaborate forms which sound produced in various powders, pastes and liquids (3). Although Jenny was a medical doctor, his primary interest was studying the way inanimate matter responded to sound from a physical perspective, rather than directly exploring the therapeutic effects of sound. 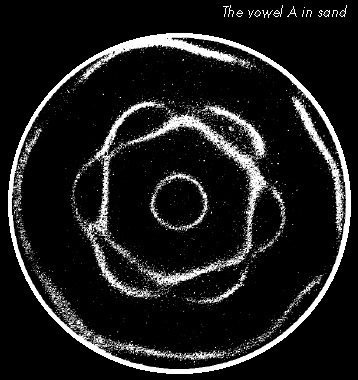 However, his extensive body of work did, in many ways, lay the foundation for much of today’s burgeoning field of sound healing, vividly showing how sound can restructure matter into a more coherent form. A short historical review may help to explain. From his studies of the natural sciences and Anthroposophy, the mystical science of Rudolf Steiner, Jenny was well aware that all matter responds to vibration in a unique way, having its own resonant frequency ‘signature’. He wished to show is empirically, using simple materials and protocols whose results could be readily repeated. Jenny’s scientific rigour opened a new chapter in the detailed study of sound patterns popularized in the early 19th Century by ‘the Father of Acoustics’, Ernst Chladni. Whereas Chladni had to steady a small steel plate covered with sand in his fingers while stroking it with a violin bow, Jenny had the advantage of electronic equipment, giving him much greater control over his experiments. This allowed him to recreate these vibrational patterns at will by reproducing the same frequency (pitch) and amplitude (loudness) of the exciting signal. He used sand, pastes, water, and a fine spherical powder called lycopodium, which is very responsive to vibration, allowing him to see the complex resonances created when a thin steel plate is vibrated at various frequencies. With subsequent advances in electronics and engineering, contemporary researchers such as German photographer Alexander Lauterwasser, and British acoustic engineer John Reid, are now able to create precise ‘sound figures’ or ‘CymaGlyphs’ in water, sand and lycopodium. Lauterwasser is the son of a well-known portrait photographer, so it’s no surprise that his focus, so to speak, has been to create and compile the most striking collection of Cymatic photographs I have seen in over 20 years documenting this field. His book, Water Sound, beautifully portrays many of the infinite ways that sound can structure matter. This fascinating array of images shows how thepowder configures itself along the node lines (areas of minimal vibration) of a steel plate, clearly mimicking naturally occurring patterns such as zebra stripes, leopard spots, tortoise shells, and even the complex structures of the ectoskeletons of crustaceans. But for me, his most awe-inspiring images are those created in samples of water vibrated in a small petri dish. As the sound waves travel through the water, they reflect off the walls of the container, creating characteristic wave train patterns, again determined primarily by the frequency and amplitude of the sound signal. The water sample is illuminated from above, and his camera is alsopointed straight down. So, as light reflects off the many ave crests on the surface of the water, the most delicate patterns appear with geometric precision. It’s important to note that these patterns are strictly the result of physical vibration; nothing is added to the water, nor are these images altered or digitally enhanced. While such figures could be derived using well-known formulas of physics, their similarity to patterns found throughout nature – from the structures of galaxies to the forms of singlecelled animals and microscopic plants – is most striking. This raises some interesting conjecture as to the underlying vibrational nature of physical reality, and Lauterwasser quotes liberally from various creation myths and sacred scriptures to support this understanding. You’ll never look at sound the same again! Well, thanks to the untiring efforts of ‘retired’ acoustic engineer John Reid, I may finally be able to give a helpful reply to that question. With the assistance of American inventor/designer Erik Larson, a greatly improved version ofthe tonoscope, which Hans Jenny originally produced as a toy nearly 50 years ago, may soon be coming to a store near you! The simple acoustic model, which Reid is calling the CymaScope Jr, is a small table-top instrument that up to four people can sing into at once, to create multi-coloured, mandala-shaped sand patterns on a vibratingelastic membrane. video camera will project these images onto a screen or video monitor. Specially designed membranes will also allow water images to be projected. A smaller, high frequency model enables the sounds of nature, such as bird songs, whale and dolphin sounds, to be rendered visible, opening a new window into acoustic analysis of animal communication. • Award-winning producer, Jeff Volk, lectures widely throughout North America. 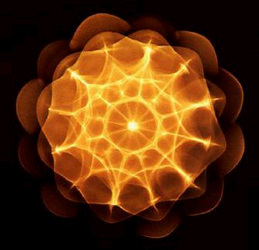 Jeff created a series of videos on Cymatics and re-published Dr. Hans Jenny’s groundbreaking Cymatics books, which scientifically demonstrate how audible sound creates harmonic, geometric patterns found in intricate life forms, and in the sacred art and architecture of the world’s Great Traditions. See Kindred Spirit’s mail order pages for some of these products.